Housing is an important source of economic growth. As of the second quarter of 2014, housing’s share of gross domestic product (GDP) was 15.5 percent, with home building and remodeling yielding 3.1 percentage points of that total. The first is through residential fixed investment (RFI). RFI is effectively the measure of the home building and remodeling contribution to GDP. It includes construction of new single-family and multifamily structures, residential remodeling, production of manufactured homes and brokers’ fees. For the second quarter, RFI was 3.1 percent of the economy. The RFI component reached a $496 annualized pace during the second quarter. This is the second highest quarterly total for RFI since the middle of 2008. Overall GDP expanded by 4.6 percent for the quarter, with RFI adding 0.27 points of that total. The second impact of housing on GDP is the measure of housing services, which includes gross rents (including utilities) paid by renters, and owners’ imputed rent (an estimate of how much it would cost to rent owner-occupied units) and utility payments. The inclusion of owners’ imputed rent is necessary from a national income accounting approach because without this measure increases in homeownership would result in declines for GDP. For the second quarter, housing services was 12.4 percent of the economy. 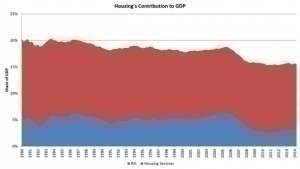 Historically, RFI has averaged roughly 5 percent of GDP while housing services have averaged between 12 percent and 13 percent, for a combined 17 percent to 18 percent of GDP. These shares tend to vary over the business cycle. Nationwide, the typical oceanfront or lakefront, single-family home is worth more than double the median value of all homes, and in some communities the median waterfront house could be worth ten or more times the median value of non-waterfront houses, according to a new analysis by Zillow®. In the U.S. at the time of this analysis, the median single-family home was worth about $171,600, while the median waterfront house was valued at $370,900, a waterfront premium of 116.1 percent. The median waterfront home value is calculated in the same way as the Zillow Home Value Index, and represents the median value of all single-family waterfront homes in a given community. The index includes single-family homes located 150 feet or closer to the waterline of an ocean or lakes with a total combined size of 10 square kilometers or greater. Properties separated from direct waterfront by a road with a speed limit of 25mph or less are also considered waterfront. Riverfront properties were not included in this analysis, nor were condominium or co-op housing units. Zillow’s initial analysis covers 250 cities and towns nationwide with at least 100 waterfront homes meeting the above criteria.